Compared to previous versions, Windows 7 is a robust and feature-rich operating system with built-in tools and functions that help make using your computer a whole lot easier, even when it’s acting up. Instead of getting exasperated and turning off your computer when it doesn’t work, Windows 7 gives you some useful features which allow you to solve problems long before they begin. If you do encounter problems, there are tools and utilities which can help you resolve these issues, often without calling tech support. Calibrate Your Screen: You just posted a picture online, when your friend messages you saying she’d love to see it, but the picture is too dark. You open it on your screen and it looks fine. What gives? It could be your screen settings. Every display is slightly different, and as such, not too displays look the same. Windows 7 tries to mitigate these differences by giving you tools to calibrate your screen. To access these tools, click on Start, type in DCCW, and press Enter. Then, follow the wizard and directions for calibrating your screen. Your settings can sometimes make all the difference between what you see a picture on your screen, versus how the rest of the world sees that same picture. Power Efficiency Report: Helpful for laptops, the Power Efficiency Report runs a utility to determine your power usage. To analyze your laptop’s power consumption, click on Start, and type in CMD. When the CMD icon appears, right click on it, and select Run as Administrator. When prompted, say Yes to allow changes. When the Command Window appears, make sure the root directory is your C: drive*. If it is not, type in cd c:\ and hit enter. The prompt should now say C:\. Then, type in ‘powercfg –energy’ (without quotes) and hit Enter. After the analysis runs, a report will be generated. Follow the path to review the results, and recommended changes. *Note: The report may not display properly if it is generated in another location, such as C:\Windows\System-32 (the default directory). To exit the Command Window, type in Exit and hit Enter. Problem Steps Recorder: If you’ve ever had your computer act up for you, but work fine for tech support, then you need to use the Problem Steps Recorder. This is a small app, which when activated tracks your keystrokes and mouse actions, and records screen shots. It then packages the information up in an easy to email file, so that you can share exactly what’s happening with tech support. To activate, click on Start, then type in PSR, and hit Enter. Click the down arrow next to the blue question mark to send the recordings to an email recipient. Troubleshoot Problems: If you want to troubleshoot problems on your own, or if you would like to fix potential problems before they get out of hand, there are some built in utilities which will help. To access these utilities, click on Start, then go to Control Panel, and click on Troubleshooting. Then run through the wizards to troubleshoot all sorts of computer problems. These are just four ways Windows 7 can help when there’s a problem. 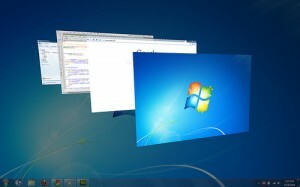 Do you have a favorite Windows 7 tip? Leave us a comment and share it with us. Julie Strier is a freelance writer who likes to help you solve computer problems before they start. Email: julie@mybusinesswriter.com. Website:www.mybusinesswriter.com.